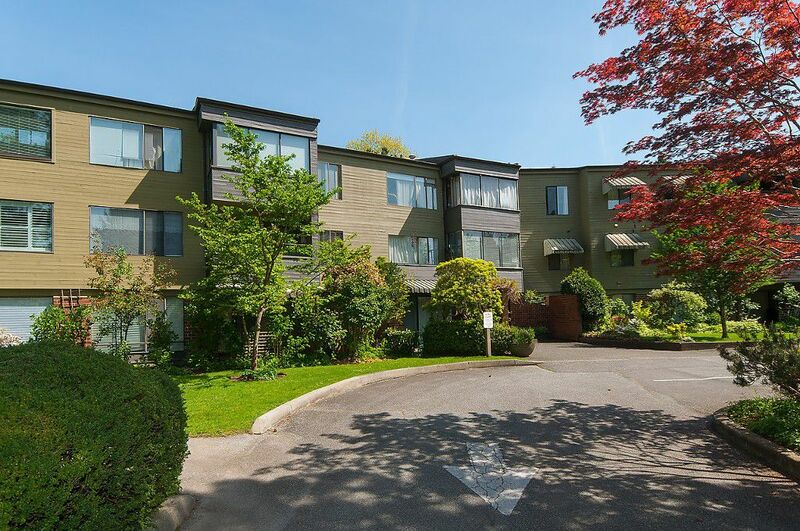 Large 1 bedroom & den/solarium in desirable Arbutus Village. On the quiet side of the building this suite features: a private tranquil treed outlook, a generous open floor plan that can accommodate house-sized furniture, a large bedroom fit for a king bed, hardwood flooring, freshly painted throughout, new blinds, updated lighting, new appliances, and an updated bathroom complete with heated floors. This complex has a resort-like setting with beautiful gardens, indoor and outdoor pool, and a large indoor recreation centre offering fitness and bridge classes. Roof recently replaced. Owner occupied building; no rentals allowed. 1 parking & 1 large storage locker. Prince of Wales school 1 block away. Walk to transit, Safeway and Arbutus shopping centre. Nothing to do but move in and enjoy.